The seventh and final season of Buffy The Vampire Slayer will be released by Twentieth Century Fox Home Entertainment on April the 5th. RRP for the set is £79.99. The six-disc set will contain all twenty-two episodes, in 1.78:1 anamorphic widescreen format, with Dolby Digital 2.0 audio. The discs also contain several bonus features, including commentary tracks for seven episodes: Lessons (by Joss Whedon and David Solomon), Selfless (by David Goddard and David Solomon), Conversations With Dead People (by Nick Marck, Jane Espenson, Drew Goddard, Danny Strong and Tom Lenk), The Killer in Me (by David Solomon and Drew Z. Greenberg), Lies My Parents Told Me (by David Fury, Drew Goddard, James Marsters and D.B. Woodside), Dirty Girls (by Drew Goddard and Nicholas Brendon) and Chosen (by Joss Whedon). You can see a selection of menu screens from three of the new discs here. Menu screens from the new Special Edition version of David Lynch's Dune can be seen here. The Incoming page has been substantially updated, with snippets of information about loads of interesting new releases. 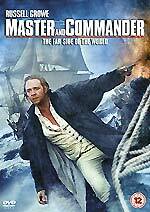 Peter Weir's seafaring adventure Master and Commander: The Far Side of the World will be released on DVD on April the 5th. 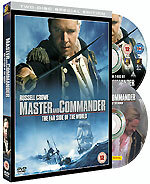 The film, which is nominated for ten Academy Awards, stars Russell Crowe as the captain of a British navy ship during the Napoleonic wars. The film will be presented in 2.35:1 anamorphic widescreen format, and will have a choice of Dolby Digital and DTS 5.1 mixes. The two-disc Special Edition is stacked to the gunwales with more bonus materials than you can shake a yard arm at. The second disc will feature a Making of... featurette, The Hundred Days (68m); Peter Weir on Directing - In The Wake of O'Brian (21m); Special Effects documentary - Cinematic Phasmids (30m); Sound Design documentary; HBO First Look special (25m); six deleted scenes (23m); The Last Battle - Multi-angle studies (camera setups and split screen vignette, 50m approx); stills galleries; and Cannon Sound - Interactive Sound Recording featurette (20m). The set will also include an Inside Look featurette about the studio's forthcoming Isaac Asimov adaptation I Robot on disc one, running just over two minutes. RRP for the Special Edition is £24.99. There'll also be a single-disc version available, which has a different cover (pictured below), so be careful to get the one you want! A few weeks ago we reported that Warner Home Video will release Luchino Visconti's Death in Venice and The Damned, and Antonioni's groundbreaking Blow-Up on April the 12th. More details are now available. Death in Venice will be presented in 2.40:1 ratio, with mono audio. The disc will also contain a nine-minute featurette titled Visconti's Venice, an A Tour of Venice photo' gallery and the film's trailer. Blow-Up will be presented in 1.85:1 ratio, with mono audio. The film will be supported by a commentary track by author Peter Brunette, and the disc will have an isolated music track and trailer. The Damned will be presented in 1.85:1 ratio, with mono audio. The disc will also contain a Visconti featurette (9m) and a trailer. Warner Home Video continues to honour their pledge to exploit their rich back catalogue of titles with the release of six films which will make their UK DVD debut on April the 19th. Heading the list is an exciting double bill of two adaptations of Doctor Jekyll and Mr Hyde. The disc will contain Rouben Mamoulian's 1931 version (for which Frederic March won the Best Actor Oscar) and the 1941 version, which stars Spencer Tracey and Ingrid Bergman. Both films will be presented in 1.37:1 ratio. Other titles are the original 1946 version of The Postman Always Rings Twice (starring John Garfield and Lana Turner, 1.37:1, mono audio); Blake Edwards' Days of Wine and Roses (starring Jack Lemmon and Lee Remmick, 1.85:1); Walter Hill's 1978 crime thriller The Driver (starring Bruce Dern, 1.78:1) and Where The Boys Are (starring George Hamilton and Delores Hart, 2.40:1). These six films will all have mono audio, and an RRP of £12.99. Richard Curtis' directorial debut Love... Actually will be released on March the 19th. The disc will feature an audio commentary by Curtis, Hugh Grant, Bill Nighy and youngster Thomas Sangster, deleted scenes and storylines, presented by Curtis (37m), the Christmas is All Around music video and "music highlights" introduced by Curtis (8m). 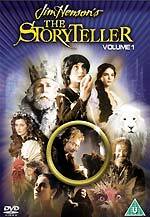 The disc will also contain something called The Storytellers, which, according to the BBFC, is nine minutes long. Fans of the film might like to know that the Region 1 disc features a different music video: Kelly Clarkson's video for The Trouble With Love Is. RRP is a hefty £24.99. Fox will be releasing Martin Scorsese's biting satire The King of Comedy, which stars Robert DeNiro and Jerry Lewis, on the 19th of April. The film will have a 1.85:1 transfer, with 2.0 audio. The disc will also contain a featurette, A Shot at the Top: The Making of The King of Comedy (18m), two deleted scenes, a theatrical trailer, a Canadian TV spot and a stills gallery. RRP is £15.99. Also due from Fox on April the 19th is the unflinching South London-based drama Nil By Mouth, which stars Ray Winstone and Kathy Burke. The film will be presented in 1.78:1 ratio, with Dolby Digital 5.1 audio. RRP is £15.99. There have been a few changes to VCI's schedule. The Director's Commentary DVD is down for release on the 22nd of March. The disc will feature a Best of... compilation of material from the series, with substantial bonus materials. Buffalo Soldiers has been moved to the 15th of March. The RRP of Death To Smoochy is now £14.99; To Kill a King will now be released on £17.99. The 2003 Joaquin Phoenix / Claire Danes romance It's All About Love will be released on May the 10th, with an RRP of £19.99. This disc should feature some bonus material. Details are filtering through from various retailers that BBC Worldwide will be releasing several more long-awaited Dennis Potter DVDs on the 31st of May, (in addition to The Singing Detective, which is due on March the 8th). 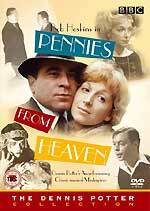 It looks like they'll also be releasing the original TV version of Brimstone and Treacle (starring Foyle's War's Michael Kitchen in the role that Sting played in the later film adaptation), the superb Pennies From Heaven and, rather surprisingly, Potter's 1971 six-part serial Casanova, which stars Frank Finlay. As usual for the BBC's classic drama titles, the discs are priced very reasonably. Between them, Play, Blackstar and the BBC Shop have them listed for about £15 each. Tartan Video is releasing Lucas Belvaux's One, Two and Three trilogy as a specially-designed four-disc box set on April the 26th. The set will feature a choice of Dolby Digital 2.0 and Dolby Digital and DTS 5.1 audio tracks, commentaries; sequential scene comparisons, deleted scenes, hidden extras and filmographies. The set has an RRP of £39.99. 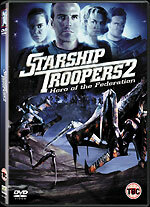 More details about the Starship Troopers 2 - Hero of the Federation DVD have been released by Columbia Tristar Home Entertainment. The disc, which is due for release on April the 19th, will have 5.1 Dolby Digital audio, and will feature a director, writer and producer commentary, two featurettes (From Green Screen to Silver Screen and Inside The Federation), a photo gallery and a theatrical trailer (presumably it's getting a theatrical release... somewhere!) RRP for the disc is £19.99. 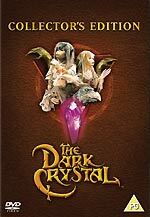 Finally, Here's a look at a couple more sleeve images: the single disc version of Master and Commander: The Far Side of the World, Columbia Tristar's Dark Crystal - Collector's Edition disc and Jim Henson's The Storyteller - Volume 1. The Storyteller disc will feature five episodes: Hans My Hedgehog, Fearnot, A Story Short, The Luck Child and The Soldier and Death. Curiously the sleeve art features at least one image from an episode that isn't on the disc (the Joely Richardson picture is from The Three Ravens). Sleeper hit Out of Time will be released on DVD by Momentum Pictures on May the 10th. 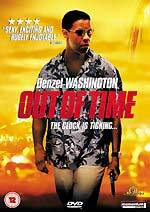 The thriller, which stars Denzel Washington, Eva Mendes and Dean Cain, was directed by Carl Franklin, who has at least two minor classics to his credit (One False Move and Devil in a Blue Dress). The disc will feature a director's commentary track, outtakes, an EPK-style featurette titled Out of Time: Crime Scene (11m), screen test footage for actors Sanaa Lathan and Dean Cain, character profiles and a theatrical trailer. No technical details were announced, but expect a 2.35:1 anamorphic transfer and Dolby Digital 5.1 audio. RRP is £19.99. 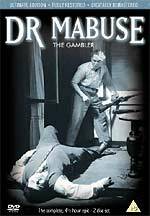 Eureka follow up their release of The Testament of Doctor Mabuse with the film that started the series, Fritz Lang's 1922 classic Doctor Mabuse - The Gambler (Dr. Mabuse, der Spieler). The two-disc set will contain the complete 270-minute version of the film, restored and digitally-re-mastered, with the original German intertitles and optional English subtitles. Bonus materials will include a three-part documentary, Mabuse's Motives, Mabuse's Music and Norbert Jacques, a photo' gallery, biographies, facts and dates. The set will be released on May the 24th, with an RRP of £24.99. Ceri is still on holiday, so there are only sporadic updates to the Incoming and Offers pages. If you spot something interesting that hasn't been listed, or an outstanding offer, you're more than welcome to email me, or contribute it to the High Street section of Roobarb's DVD Forum. Ceri has pointed me towards a few interesting things which have passed through the BBFC in the last week or so. It looks like the BBC has finally got around to certificating the material in their Oscar Wilde Collection box set, which was released back in January last year. (Often the BBFC will issue a provisional certificate, but a title apparently won't be formerly added to their database until their paperwork is complete, and their invoice paid). It looks like you can still get the Oscar Wilde Collection from Blackstar. A similar set is available from the US. Acorn Media has certificated all thirteen episodes of the excellent Granada TV detective series Cribb, which was made by much the same team as the Jeremy Brett Sherlock Holmes series. It starred Alan Dobie as a dour Victorian detective, aided by the bluff Detective Sergeant Thackery (played by Heartbeat's William Simons). Six episodes of the series - the first season -were released on DVD in the US by BFS Video in 2002, but there's been no hint that the rest will follow. A complete UK DVD release from Acorn would be most welcome. Acorn have also submitted the 1978 LWT romantic drama Love For Lydia, which featured Jeremy Irons, Peter Davison and Mel Martin. Blackstar and Anchor Bay's website are listing Peter Newbrook's tame 1972 horror movie The Asphyx for release on April the 26th. There are virtually no details on the Anchor Bay site, apart from a note that it will be presented in its original 2.35:1 ratio. Blackstar, however, are listing it with a running time of eighty-two minutes, about seventeen minutes shorter than the restored version released in the US by Allday Entertainment (you can read a brief review of the US disc - which is now out of print, incidentally - here). Anchor Bay has also recently submitted the recent Italian-financed mini-series adaptation of Dracula, which stars Patrick Bergin as Vladislav Tepes, Hardy Krüger Jr as Jonathan Harker and Stefania Rocca as Mina Harker. The BBFC has certificated a forty-eight minute behind the scenes documentary titled Down at Fraggle Rock, which is presumably destined for the forthcoming DVD (see last week's News page). Finally, thanks to Jerome Wybon for pointing out that several retailers are listing a UK DVD release of the recent Battlestar Galactica mini-series, which seems to be due on the 1st of March. Play.com even have a pack shot.